With the 100th anniversary of the RAF on 1st April, just a week away today, this blog post is my own little tribute inspired by the apocryphal storyline in the film about the Spitfire "The First of the Few" and the photographic inspiration of Dave Black whose recent image of seagulls in a feeding frenzy fired my imagination. 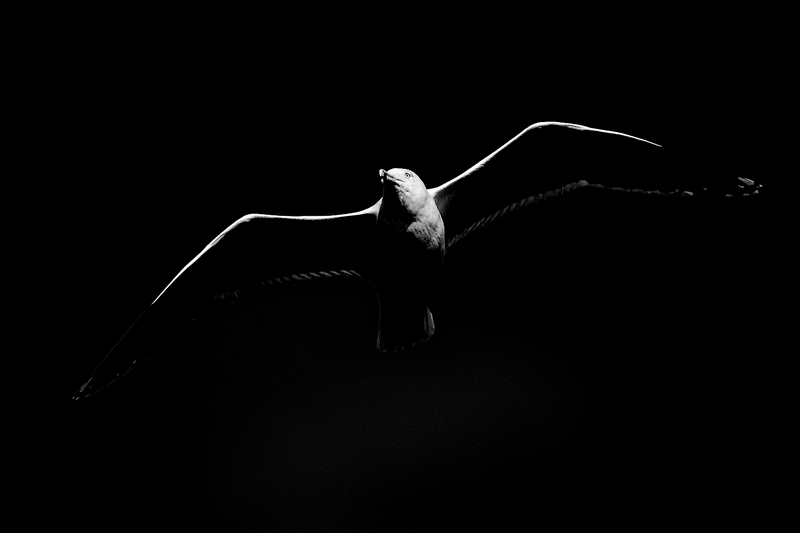 The form of gulls in flight has always fascinated me and where I live I am fortunate to often have them face on, comparatively low down and with the sun behind my back which gives great illumination. An almost cloud free sky and with the sun still fairly low I was afforded opportunity to get a number of shots of a mature gull in effortless flight with the sun highlighting its head feathers and the white feathers on the leading edge of its wing. Under exposure and removal of tone through use of black and white did the rest. 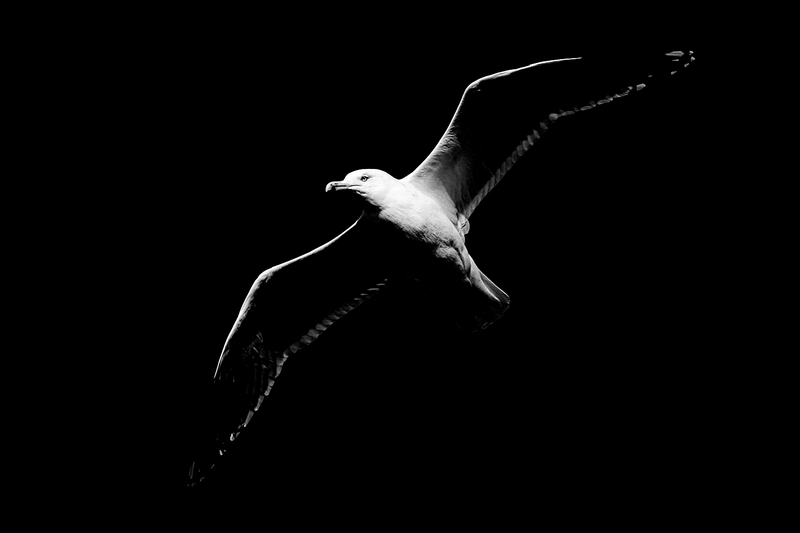 I like the way the light just highlights the essential characteristics of the gull in flight but the bird is still instantly recognisable as a seagull. The Mitchell's design of the Spitfire wasn't inspired by Seagulls, instead it was a progression of many designs, some failures and great design ability. However in same ways I wish it was as I can still picture the scenes of dog fights from the film with the distinctive spitfire shape powered through the air by its Rolls Royce Merlin engine. As to real gulls in flight, well they are in many ways the Rolls Royce of the air. Few birds match their effortless grace as they use the wind to soar and sweep over buffs and cliffs along the coast. The three images were all taken with the seagull on a head on glide over my camera position with wind and sun directly behind me. Under exposure by nearly three full stops left only the white areas of the bird highlighted in the final image. The exposure was adjusted to bring in a few of the trailing edge wing feathers to give more shape. In the first image I loved the quizzical look on the face of the seagull but the exposure wasn't right. Likewise in the second image I felt there was too much of the seagull's body for the image I had in mind. In the final image i like how the light falls and the shape of the bird with the single eye also providing an added focus. 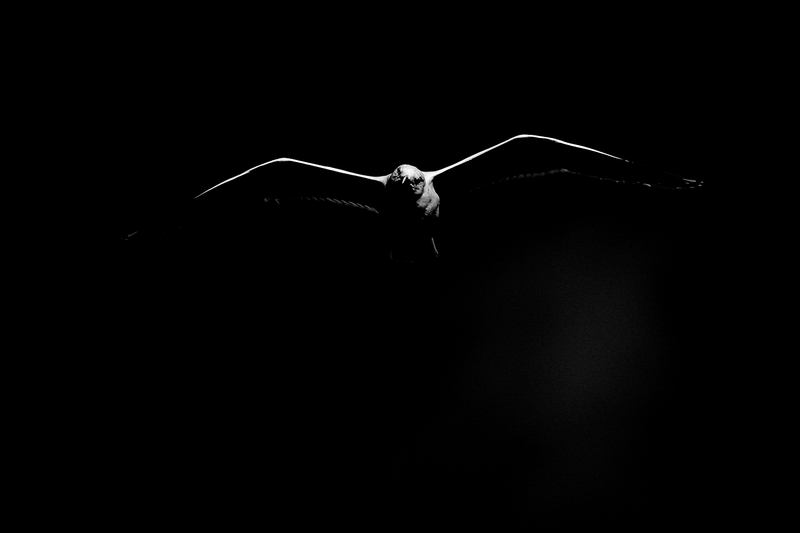 I will continue to experiment with how I can use natural light and form in both nature and sports photography but the end image I managed to create of the seagull was certainly close to what I was imagining in my head as I reminisced about those childhood black and white Saturday morning films. Canon 1DXii with EF200-400 f4.0 with extender engaged (shot at 560mm f5.6). ISO 640 1/3200.